It’s official: our Supply Chain and Operations Management students are a force to be reckoned with on the international stage. 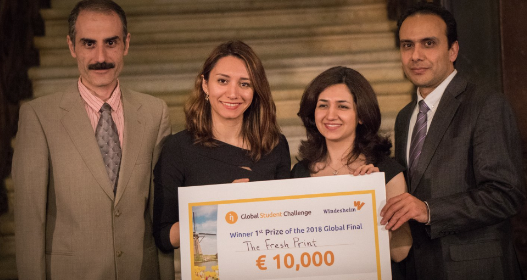 A team of four students took first place and a €10,000 cash prize at the Final of the Global Student Challenge in Zwolle, the Netherlands. Team members Nasim Changizi, Nasim Darabi, Shahryar Ebrahimi and Ahmad Kianimoghadam are all students in the School’s Diploma in Supply Chain and Operations Management program. The team won first place in the North American competition and advanced to the world final of the international competition, where they bested 27 finalists. In all, the team out-performed more than 20,000 students representing 1,200 universities and over 100 countries during the different stages of the Global Student Challenge 2018 powered by The Fresh Connection and The Cool Connection business simulations.